Did Candlestick Park Cost Willie Mays 100 HRs? This is what Pete Hamill said in his review of the new book on Mays. See Willie Mays, the Say Hey Kid. Here is what I came up with on this. For the entire NL in this period, the home HR% was 2.34% while on the road it was 2.25%. The home % is 4.2% higher than the road % (since 2.34/2.25 = 1.042). Mays seems to have gotten more out of his home park that most players. If we give him 100 more HRs at home, his home HR% rises to 10.04%. That is about 50% better than what it really was and about 73% higher than on the road. Should Chipper Jones Retire If He Has Another Disappointing Season? "Jones’ frustration and talk of retirement came after seeing his batting average drop 100 points last year. He led the National League with his .364 average in 2008 but fell to .264 last season with 31 fewer hits in almost 50 more at-bats. He said last year he won’t keep playing if he doesn’t return to form this season. He’s sticking with that stance this spring. “It was a true statement,” Jones said. “If I don’t play this game at the level I want to play it at, then I will walk away from it.”"
"Jones started strong last season, hitting .322 in April and .312 in May. His average peaked at .335 on June 9. He hit only .230 the rest of the way and drove in only 30 runs after the All-Star break." His OPS before the All-Star break was .878 while it was only .750 after (he usually does not decline like that). Even then, a .750 OPS is not terrible. The NL average excluding pitchers was .761 (from the Lee Sinins Complete Baseball Encyclopedia). His offensive winning pct (OWP) for the whole year was .603. Among the 222 players in MLB last year who had 400+ PAs, that was 56th. So he was better than 75% of the roughly full-time hitters. And among the 183 37-year olds who ever had 400+ PAs, his .603 OWP is 57th, which puts him in the upper 1/3. So his entire 2009 season should not be seen as a disappointment. His career OWP is .697. It does not seem that strange for a 37-year old with that number to register a .603. Was The US Hockey Gold Medal in 1980 A Miracle? Do you believe in critical thinking? If not, stop reading. The movie "The Miracle," about the 1980 U.S. Olympic hockey team, provides a great opportunity to use critical thinking, which shows that the game against the Soviet team was not as big a "David vs. Goliath" story as the movie made it out to be. But first, it's a good movie. Kurt Russell portrays coach Herb Brooks well. Brooks was a good coach who did a great job of preparing his team. The hockey scenes are exciting. The team spirit and patriotism in the movie seem sincere and genuine. Thumbs up. But back to the "David vs. Goliath" angle. Was team USA a "David?" In hindsight, we know that twelve of the U.S. players went on to play in the NHL. Some very soon after the Olympics were over. Some had long and fine careers. So the talent was there. At the end of the movie, we're told what the players are doing now. But no mention of their NHL careers. If they had mentioned this, we might not have seen them as such a little "David." So the director only told us what he wanted us to know, to play up his angle. If we compare the U.S team in 1980, to the team in 1960, which also won a gold medal, we can see how good the 1980 team was. Only two players from the 1960 team made it to the NHL and one had a career of only 12 games. Now, in 1980, there were 21 teams in the NHL and in 1960, there were only six. So if it were 3.5 times easier to make it to the NHL in 1980, we might expect 7 players from the 1980 to make it if they had the same talent level as the 1960 team (3.5*2=7). But many more, 12, did. Furthermore, the 12 from the 1980 team played a total of about 6,000 games in their NHL careers while it is just 675 for the 1960 team. So it seems even more miraculous that the 1960 team took the gold since it looks like they had much less talent than the 1980 team. The 1960 team also beat the Soviet Union, who were the defending gold medal winners. Haven't heard about a movie for the 1960 team. Were the Russians invincible? No. But the movie shows the U.S. players watching the Russians beat a team of NHL all-stars 6-0 on TV just prior to the Olympics. If you know nothing about the history of hockey, you might say to yourself while watching the movie, "wow, how can these young kids beat a Soviet team that clobbers the NHL's best?" Well, that 6-0 loss was part of a three game series in which the NHL won one game (4-2) and the other was close (5-4). In 1972, a team of NHL all-stars beat the Russians in a seven game series. In 1976, a team of NHL all-stars won the Canada Cup tournament, which pitted the best national teams of the world against each other. This included the Russians, who won 2, lost 2 and tied 1. Also, these NHL all-star teams did not spend six months practicing together as a team like Team USA did in 1980. If they had, they would have done even better and the Russians would not have looked so invincible. It takes both talent and team work to win. The old format of the NHL All-Star game also shows the value of teamwork. In 1950s and 1960s, the defending Stanley Cup Champions played a team of All-Stars at the start of the NHL season. Obviously the All-Stars had more talent than could be assembled on any one team. But the all-stars only won the series 10 wins to 7, with two ties. The Detroit Red Wings beat the all-stars 7-1 in 1950. In 1959, the Montreal Canadiens beat the all-stars 6-1. So sometimes all-star teams get beat pretty bad because they have not had a chance to practice together as a team. To make an issue out of one game (the 6-0 game mentioned above) is to reach a conclusion based on a small sample size. That can be very misleading. In the final seconds of Team USA's victory over the Soviet Union in 1980, the announcer Al Michaels shouted, "Do you believe in miracles?" Calling something a miracle does not make it so. If you believe in critical thinking, you won't be so easily fooled. Maybe the movie should have simply been titled "The Upset." But an upset is not as compelling as a miracle, now is it? You can actually see pretty much what I wrote as a comment at IMDB. Click here to see it. You just have to scroll down a bit. You can see the date it was posted. Look for "Good but misleading, 12 February 2004." Also, an article about me that was published in the Chicago Sports Review in 2004 mentions the article. Click here to see that. You will see that it was posted August 13, 2004 09:55 PM (GMT). Look for where it says about me and my website: "He even includes an essay he wrote debunking one of this country's most cherished myths: that the 1980 U.S. Olympic hockey team's win over the Soviet team was a miracle. Morong's essay calls it an upset, yes, but by no means a miraculous victory." How Good Has Tim Lincecum Been At Preventing HRs? It looks like he was very good in each of the past two years. I am not going to discuss the issue of what percent of his flyballs became HRs. That is important, though. Derek Carty has written about the idea that pitchers might differ in their ability to prevent flyballs, but not in their percentage flyballs that become HRs. That article is at Using FIP to evaluate pitchers? I wouldn’t. I am going to look at Lincecum's HRs allowed relative to the league average. The data I used comes from the Lee Sinins Complete Baseball Encyclopedia. Here is how it works. Suppose a pitcher gives up 10 HRs while the average pitcher would have given up 20. You divide 10 by 20 to .5. Then 1/.5 = 2. That gets multiplied by 100 to give you a rate of 200. In 2008, Lincecum gave up 11 HRs while the average would have been 26 (actually it would be about 25.85 but when you call up this kind of data with the Sinins tool, it does not have decimals, it just rounds everything.) So his rate for 2008 was 235. In 2009 he gave up 10 while the average would have been 25. His rate was 249. This seems pretty good, two straight years over 200. Now being a right-handed pitcher, he gets an advantage pitching in AT & T park where it is tough for lefties to hit HRs. Bill James has a HR factor their for left-handed batters over the years 2007-9 of 88, meaning that it allows a rate to lefties equal to 88% of the league average. The righty park factor is 93. So I adjusted his HR totals based on these park factors. In each year, I raised his HR total vs. righties by 3.5% since AT & T allows 7% fewer HRs to those batters and the Giants play half their games there (using Baseball Reference, he actually faced about 51% of his batters at AT & T (didn't mean to go Empire Strikes Back on anyone)). So I will just stick with one half. His HRs against lefites get increased by 6%. He gave up 7 HRs to RHB in 2008. Raising that by 3.5% makes 7.245. He gave up 4 to LHB and raising that by 6% leaves 4.24. so his adjusted HR total for 2008 is 11.485. In 2009, he gave up 2 & 8 HRs, respectively, to RHB & LHB. Adjusting that would leave a total of 10.55. But if I recalculated his HR rates for the two seasons, they are 225 & 236, respectively. Still very good (by the way, he gave up no HRs at home in 2009). How many pitchers have had back-to-back seasons with a HR rate of 200 or higher with 200+ IP in each year? I only looked since 1920, but it is only 17. Some of those pitchers did for more than 2 straight years. Greg Maddux did it 5 straight. To see all the cases click here. Eppa Rixey did it in 1923-4 and 1927-9, too, but he did it in a very tough park to hit HRs. The Reds park, from 1920-29, it allowed only 22% as many HRs as the average park in the NL! (that is according to the STATS, INC. All-Time BASEBALL SOURCEBOOK). The total number of consecutive occurrences is just 25, including Lincecum these past two seasons. I also found the top 100 combined two year HR rates using only pitchers who had 200+ IP in both years. Since 1920, I found 2,310 cases of a pitcher having 200+ IPs in back-to-back seasons. To see the top 100, click here. When you see a year in that table, it is the 2nd year in the case. The AVG is weighted by the IP in each season. Sad Sam Jones was a righty pitching in Fenway when it took a long poke to get a HR by a LHB (I think it was before they had the bullpens out in RF). He gave up just 1 HR in one of those years. Notice that Reds pitchers from the 1920s-30s are up there again (Rixey, Luque and Donohue). Maddux 1994-5 is 9th with 406.1, basically being 4 times better than the league average. It looks like the only guys ahead of him are guys who got alot of help from their parks (I don't know about Coveleski). I don't think Maddux got much help from his. James has Atlanta with a HR factor of over 100 from 1993-6. Lincecum from 2008-09 is 54th. Even with the adjustment I did above, I think he would fall to about 63rd. Out of over 2300. Not bad. There has been some discussion recently on whether or not Kenny Lofton should make the Hall of Fame. I am not going to try to figure that out. But it was pointed out that Lofton actually has a slight edge in WARP over Tim Raines, who, as many believe (including me), should be in. But one thing I thought was interesting was how their relative values would change if we tried to estimate their offense based on their lineup slot (mostly leadoff). Evaluating Hitters Based on Their Lineup Slot. Lofton was about 2.2 more runs better per season than his stats would indicated once you took the fact that he was a leadoff man into account. But Raines was 3.9 runs better. If you project that out over 16 seasons, Raines gains 27 runs relative to Lofton or about 2.7 wins. Most of you probably know that Ken Williams, in 1922, was the first player to hit 30+ HRs and steal 30+ bases in a season. A book review last week in the Wall Street Journal said it was Mays. So I wrote a letter to the editor and it was printed in today's edition. You can read it at 'Say Hey' Guy Wasn't First to Achieve 30/30. I checked the book at Amazon and I think the author got it right, saying he was the first in the NL but I don't think the book mentions Ken Williams. 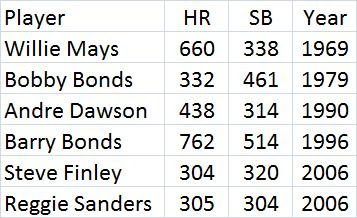 I also mentioned in my letter that Mays was the first player to get 300 HRs and 300 SBs in a career, a feat which has not been accomplished nearly as many times as the 30/30 season. 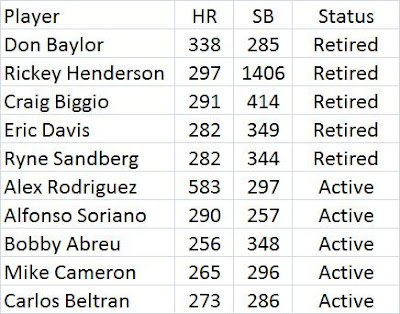 Only 5 other players have reached 300/300 for a career while the 30/30 season has been done 54 times (twice by Mays) by 33 different players. The table below shows all the players with a 300/300 career and the year when they had first crossed both milestones. Some player came close to a 300/300 career while a few others are still active and getting close. The next table shows them. Rickey Henderson missed alot of games due to strikes (1981, 1994, 1995). Maybe over 100. He might have gotten 3 more HRs without the strikes. Biggio missed about 60 games, so 9 more is not out of the question (although he hit only 6 in 114 games in 1994). I estimate the strikes cost him 6 HRs. Eric Davis looked like he would do it early in his career. By age 28 he had 166 HRs and 233 SBs. But he had lots of injuries and cancer. He never once played 140+ games in a season and only played 130+ 5 times in a 18-year career. He played a total of 1,626 games. So he came close to averaging 30/30 per 162 games. Sandberg only hit 5 HRs in 57 games in 1994. He retired for the first time then. He returned in 1996 and hit 25 HRs. It is very possible he could have 18 in 1995. Some people wondered about how McGwire compared to his contemporaries. Others wondered about how other players, who, like Big Mac, had injuries in their younger years. So I decided to simply find all of the players with 2,000+ PAs from ages 31-37 who also had at least 500 PAs under age 31 (that low PA total was so I would not leave anyone out). Then I found their relative SLG in both age periods and found the ratio of the old relative SLG to the young. Ken Caminiti finished first. His "young" relative SLG was 94 while his "old" was 124. So gets 124/94 = 1.32. That was the higest old/young ratio. So his SLG improved the most, relative to the league average. You can see the complete rankings by clicking here. McGwire finished 7th. Some of you might realize that guys who finished high, like Caminiti, played their younger years in tough hitters' parks (he played in the Astrodome). Other guys, like Skeeter Newsome, played a good part of their olders years during WWII when the competition was not so good. That helps his rankings (spending time doing studies like this is worth it just for learning about guys named Skeeter). This particular ranking does not included park adjustments. Parts 1 and 2 did, and McGwire did very well in those cases. As for injuries, I don't know how to adjust for that. I don't know how much McGwire's relative SLG was held down in his early years, though. If he played hurt it was. But if only played when he was 100%, then his relative SLG was not affected. Readers will have to judge for themselves how he compares to others who played hurt. I don't know for sure who they might have been. One commentor asked about pitch selection. Certainly players who get better at only swinging at good pitches will hit better. But how do you measure that? You could use walk rate. But guys who slug better get walked more anyway. So it would not be clear what you are measuring. And Hal Chase finished 19th. But he never cheated. In Part 1, I compared his and all the previous players with 400+ HRs in how their SLG from age 31-37 compared to their SLG from when they were under 31. McGwire came out first in this ratio. Here, I am following a suggestion made by Walt Davis who said "I'd be interested in comparisons of on-contact SLG, ISO and OPS relative with league average..." I use the on-contact ISO. (If I get a chance I will add the on-contact SLG-UPDATE: I just posted that, 2-4). ISO is isolated power and is usually SLG - AVG. Here is the ranking for SLG on contact or TB/(AB - K). McGwire had .691 under 31 and .968 from 31-37. Since .968/.691 = 1.40, that is what McGwire gets.